Vacation rental cabin / bungalow. Sleeps 10, 3 bedrooms, 2 bathrooms. Dogs allowed. Great location; walk to town. Approx. 1500 s.f. 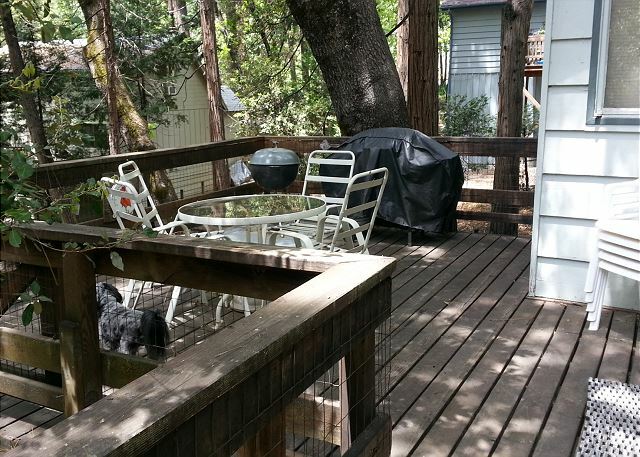 Back and front child-safe decks; yard totally fenced; handicapped accessible. Large common area; cozy and comfortable with every amenity. You'll feel right at home! High Speed Internet line a big PLUS! Cabin Layout: Single Level. Living/Kitchen; Laundry; 1 BR w/2 Doubles; 1 BA w/Shower; 1 BR w/King; 1 BA w/Shower; 1 BR w/King (2 rollaways available). We rented this property for a three day vacation with our two grandsons age 11 & 13 years. The property is in an excellent location close to town. Walking distance if you choose to. The street it is on is quite busy and the parking is limited but adequate. The house was very well equipped and the kitchen had everything we needed. One drawback was the house is not air conditioned and in 95 degree weather could be a challenge. There were ceiling fans in the living room which helped, and a portable cooler we used in the master bedroom. There were no instructions for the cooler and I had to google the instructions on how to fill it with water. There was a box fan but it had a broken blade that made it ineffective. We enjoyed our stay here, used the very nice BBQ and enjoyed the back deck for evening conversation. Really enjoyed our stay! We brought our border collie. The deck and backyard were fenced in, so our dog had a great time. We will definitely stay at this property again. Our family loves this place. It's comfortable and spacious from the front room to the kitchen. Open floor plan allows for people and games to interact easily and help with cooking on a generous table. We have stayed her many times. It is such an easy, easy walk to downtown - we often don't cook and walk to the restaurants, followed by a game of mini-golf or bocce ball. The property manager is very helpful and can get in touch when ever we needed help in the rental process and with the house in general. Downsides in case it matters: parking is on street, need to u turn to park in front. And a fairly busy road, but enough room to walk on the shoulders the approximately 3-4 blocks to downtown. 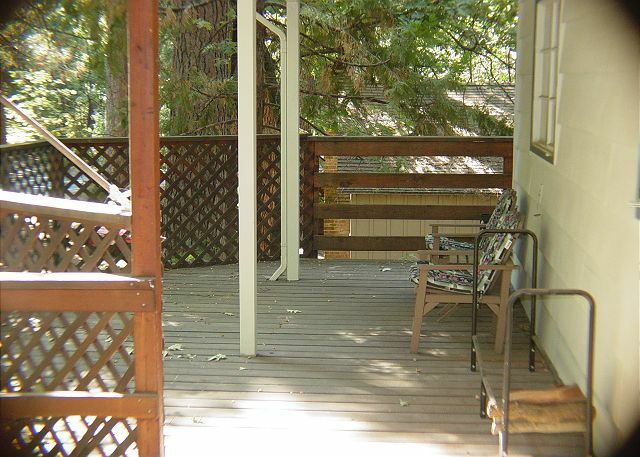 This is our favorite cabin/home to rent in Twain Harte and we are always happy when it is available. Having spent summers in Twain Harte as a child and youth I never tire of the town. All the restaurants are fantastic! Several rival any we have in Oakland; my friends are amazed that I travel here to have steak & lobster. The only drawback this time of year is that the mini golf site is closed. Great location and space for a big family getaway. Six adults, one kid, and a dog all had plenty of room to be comfortable and have fun. Kitchen was welll stocked spacious. Twain Harte is an awesome vacation town and we can’t wait to get back and explore the area more! Well equipped cabin. Comfortable beds for all. Dog friendly; good internet; well equipped; Busy, noisy street main road into town... (which we knew prior to rental) but quite at night. We would rent again. 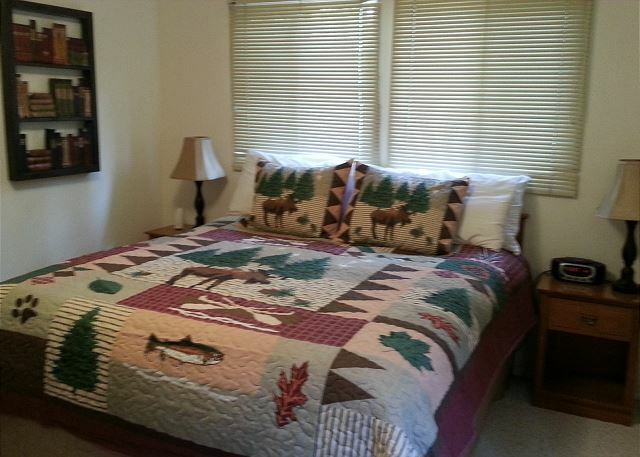 Great rental all on one level, which is important for grandparents and seniors Cabin has everything needed for a perfect stay. Living room is spacious, seating for a large group. Nice and clean and did not suffer from summer heat. Evenings on the back deck are delightful. Walking distance to main summertime activities. Would gladly stay there again. Margie is a great manager and is always available to answer questions and help if needed. Cabin was great only downfall is the parking. We were there for a wedding and had multiple cars. Other than that the cabin was perfect plenty of room for everyone. My family and I were looking for a quick, last-minute ski trip to Dodge Ridge and were having trouble finding a place to stay. The manager responded quickly to our booking request and the property was exactly what we were looking for. It was quite spacious and could easily hold 8 or 10 people without feeling cramped. The cabin was clean and the kitchen was well stocked with dishes, pots/pans, and cooking utensils to enable us to relax and cook up a quick meal after a great day on the slopes. The location of the cabin was great, just off of the main area in Twain Harte with shops, restaurants, and a market all quite close. I would recommend this property! My family and I stayed here over New Years and we had a wonderful time. There was only 4 of us but, you could have a lot more people and still be comfortable. The cabin is very spacious, comfortable and very clean. The fireplace is so nice and really heats the room up. 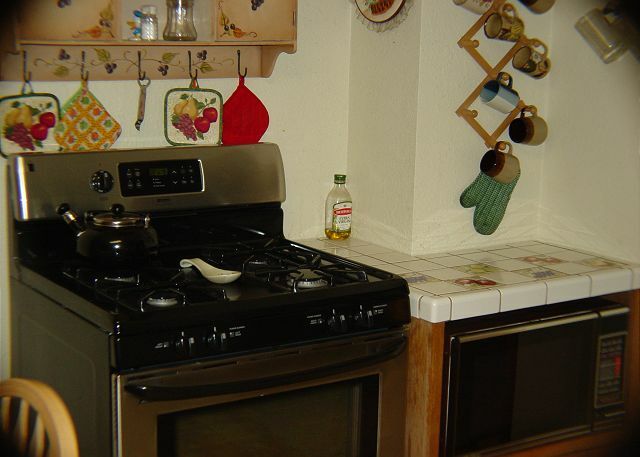 The kitchen is spacious too and has everything you would need. We felt so at home here and had a wonderful time. We will absolutely rent this cabin again and would recommend to anyone. We had a lovely long weekend here - it was so great for our dogs and three generations of family. 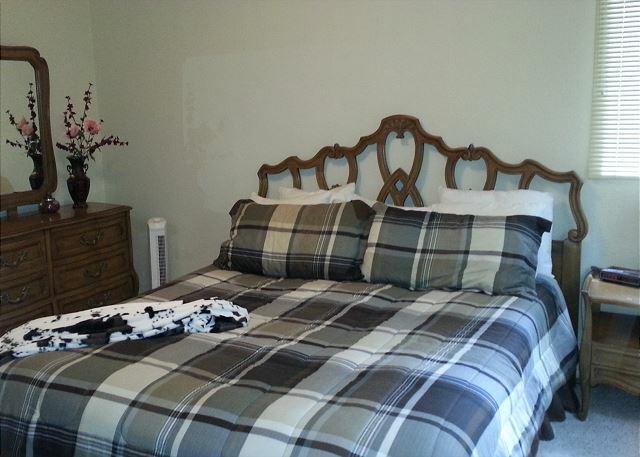 Clean, comfortable, great large beds and terrific fenced in outside area for dogs. So close to town - just .25 of a mile. We'll be back! Great house, great location, helpful management person! This was our second stay here, last one was in the snow at Christmas. Great location for walking to town, which we did several times. Great living room and kitchen space for keeping the family active together or at least in sight for conversation. Nice and cool inside with ceiling fans and a portable cooler (which we didn't need). Definitely keeping this as one of our go-to places. We, a pair of septuageniarians, our daughter and our son-in-law stayed at the Twin Pines for the second time this year and enjoyed it as before. We have spent time at many other cabins managed by Twain Harte Vacation Rentals with friends and relatives over a period of 50 years and have always enjoyed our visits. We had such a wonderful time here! Everything was perfect. One thing I will suggest is you guys make it clear just how high the steps are getting into the property. The ramp we had was 3-4 inches and we had to go up to ACE for wood. We had someone in a wheelchair. The property was open and spacious for the wheelchair to get around perfectly. We had a wonderful time enjoying our time together in Twin Pines 7. The cabin is fully equipped with everything we needed to enjoy a long weekend and play with grandchildren in the comfortable living room. The house is just spacious enough to spread out, it's quiet for sleeping at night and I especially appreciated it is at street level. The cabin was very clean, something I care very much about when being with my family and especially the little people. The location of the cabin is another real plus, close to everything, within walking distance but not a lot of traffic going past the cabin! I highly recommend this place and I've stayed at several in the Twain Harte area. This is our new favorite and we'll definitely return if we can!!! Thank you for a great place to make memories! This cabin was the perfect set up for our family of six adults and a baby. The living room had plenty of seating for everyone and the fireplace was really nice. The kitchen had all the cookware and dishes one needed. The bedrooms were a good size and the beds were comfortable. The back deck looked like a great place for warmer weather. Our family had a fun time and would like to rent again in the future. This cabin is on a main road which was quite busy sometimes but that did not bother us. thanks for supplying the snow just in time! Easy walk into town so we didn't have to dig the cars out till it was time to go home! Loved the location and we will rent again! Great one level inside, plenty of space to move about. Good for those with limited mobility concerns. We had the best experience at our cabin. Everything was in great working order clean and convenient for walking to town. I can't express enough how much we enjoyed time at this cabin. Thank you Margie. The management of this cabin provided us with all the information we needed for our great stay there. I would recommend anyone to come up and enjoy this cabin and Twain Harte. We were a total of six people (4 adults, 2 kids) and TP7 was overall a great place to stay. Cozy living room with a nice fireplace and the roomy kitchen/dining area were comfortable with room for everyone. The rear bedroom with the glass door was always cold, so we did not sleep in it. The hot water heater was seemingly set to "surface of the sun" - no problem to have a nice, hot shower. There was only a little firewood and we called the manager as we left for the day - on our return there was a whole pile of newly cut wood ready for the fireplace - they're on their game. The house is just a couple of blocks from 108 and the downtown area, really convenient. All in all it was a great stay - we'll be back! We came to ski at Dodge Ridge and also to rest and relax with our family. There is about a 30 minute drive to Dodge Ridge but alow more time during heavy traffic times. This lovely house is located so close to downtown and you can walk to almost anywhere. It was extremely clean and had everything we needed. We had a lovely time. We plan to return as soon as possible!! Thanks so much!! My best stay in Twain Harte since my childhood. As a child I spent my summers in Twain Harte. As an adult I returned about six years ago. This was my second year coming at Halloween; we make a special effort to go by Ed's Cocktail Lounge to see the fantastic decorations which Kim spends a month putting up. This is now our favorite cabin to rent: close to town, clean, quiet, and plenty of room. I spent my summers growing up in Twain Harte. A few years ago I returned and have been visiting 2-3 times per year. 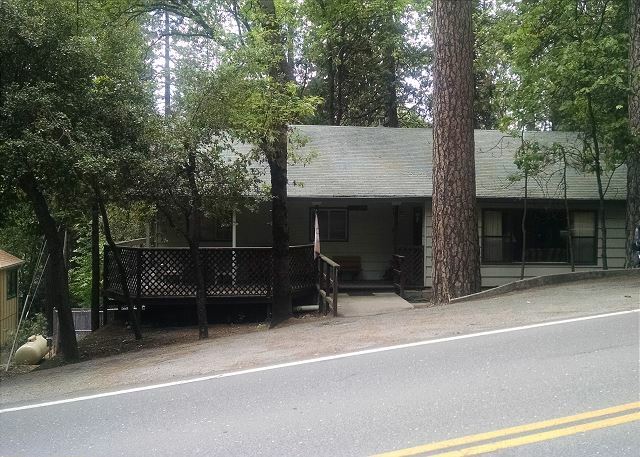 This cabin location is great with a two block walk to the center of town. 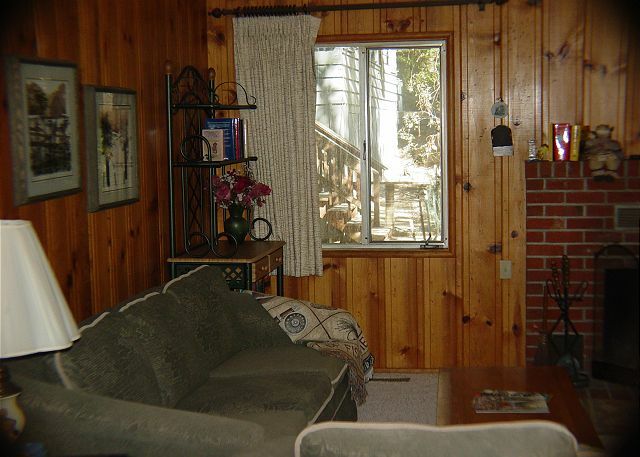 It features large rooms with a covered deck in front and a private deck in back. I plan on returning to this cabin many times. The only thing I would like is a note on the refer to make sure the back porch light is to be turned off before going to bed a night. The neighbor came over after the first night and asked us to do that. She was very nice about it and told us it happens all time. Again great place and I think the family will be using your company again. great location!! 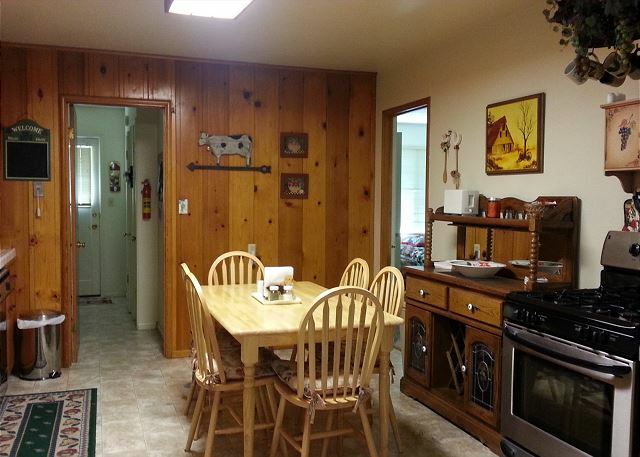 cabin is a 20-25 min drive to the snow play areas and very comfortable for 7 people and a large size dog. cabin is fully equiped especially kitchen! had a large fenced in yard. couple of negatives- cabin is facing busy street (4 stars instead of 5) and mattresses on pullout beds are too soft. 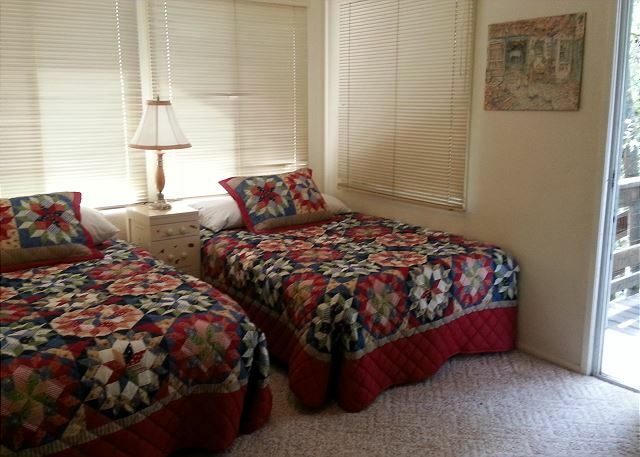 We have been visiting Twain Harte for several years and we have used THVR for most of our stays. We have loved being able to bring our dog and we always get our full deposit back...even when we have broken a glass or not taken our garbage out. Thanks so much Margie for your patience with many of our last minute reservations and inquiries. We had a wonderful, relaxing Thanksgiving, and we can"t wait to visit again soon! Very nice cabin, more like a home very large. Only one thing it needs is a blue ray dvd player took some movies to watch but they were blue ray and could not watch them. We'd rent this cabin again!!! that bedroom. THVR was helpful as always. The property was not kept up on the outside but the inside was great. The only complaint is that ther was no cable on the living room tv and the microwave did not work. Comfortable place in a nice little town. We were disappointed that the advertised internet access didn't work. We love Twain Harte and the realty staff is always friendly and helpful. This cabin was great for us. Thank you. We spent February vacation week here. It was comfortable, roomy, and met all of our needs. Convenient location; easy drive to Dodge Ridge, Leland SnowPark, and Sonora. Short walk to downtown. Level driveway/ entrance. My sons loved the back yard. 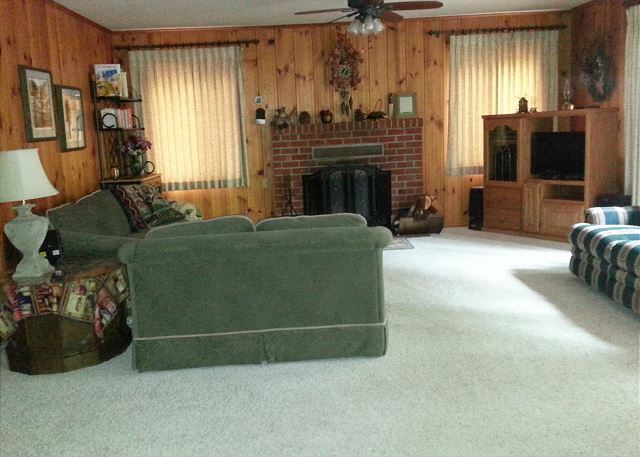 This home was clean, nicely furnished, with a large living room area that was perfect for our family gathering. The only downside of this home is that it is situated on a major road in Twain Harte which carries substantial traffic compared to most of the other residential streets in Twain Harte. We loved the spacious cabin and the kids and dog loved the large fenced yard. Their was no snow on the ground in Twain Harte, but, 10 min up the mountain their was . The cabin location was very convenient. The house was clean and well equipped. The firewood took a little time to get started but was able to utilize some of the sticks found in the back yard. Other than that, the place was great and had a wonderful time. This house is very comfortable and clean. It has an incredible fireplace (with insert) that really warms the house. My only comment to other guests is to remind them that it is on a fairly busy street in Twain Harte and also fairly close to other houses, so privacy and quiet from traffic noise might not be as great as in other locations. THE ONLY THING THAT WE MIGHT LOOK FOR IN THE NEXT CABIN THAT WE RENT IS A STREET THAT IS LESS BUSY. WE HAD OUR BULLDOGS WITH US AND WE WOULD HAVE LIKED TO HAVE WALKED THE DOGS IN FRONT OF THE CABIN. THE STARES OFF THE DECK WERE A LITTLE TO DIFFICULT FOR THEM TO HANDLE. YOU HAVE TO KEEP IN MIND THAT THEY ARE BULLDOGS. MOST DOGS WOULD HAVE BEEN FINE. ONCE WE MADE IT DOWN, THE BACK YARD WAS PERFECT FOR DOGS. VERY SAFE AND SECURE.SHORTY HAD A GREAT TIME! HE FOUND A SOCCER BALL THAT SOMEONE HAD LEFT BEHIND! I HAD TO TIE THE TEATHER BALL UP HIGH SO THAT HE DIDN'T DANGLE FROM IT. DON'T KNOW HOW HE DOES THAT. HE IS LIKE A BOULDER WITH LEGS. MY FAMILY HAD RENTED THREE OTHER CABINS AND WERE CLOSE BY.WE ALL HAVE WONDERFUL CHILDHOOD MEMORIES OF TWAIN HARTE. OUR GRANDPARENTS BUILT A CABIN BACK THEIR, BACK IN THE FORTYS. WE SPENT OUR SUMMERS,HORSE BACK RIDING, SWIMMING AT THE LAKE ALL DAY, GOING TO THE OUT-DOOR MOVIE AND SKATING RING. WE WERE EVEN ALLOWED TO WALK BACK TO THE CABIN AT NIGHT WITH A FLASH LIGHT! OH, AND OF COURSE WE COULDN'T WAIT TO PLAY MINATURE GOLF. 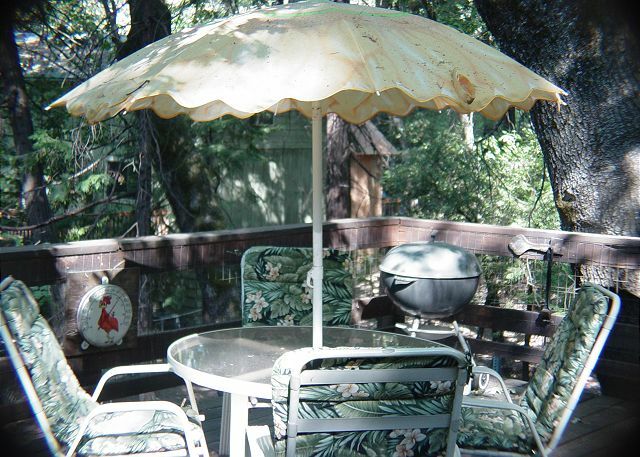 THERE HAVE BEEN MANY CHANGES OVER THE YEARS , BUT TWAIN HARTE IS STILL A WONDERFUL PLACE TO VACATION. THE CABIN WAS SOLD MANY YEARS AGO BUT WE STILL COME TO TWAIN HARTE TO GATHER WITH FAMILY AND SPEND SOME VACATION TIME. I'M HAPPY THAT PEOPLE ARE GENEROUSE AND ARE WILLING TO SHARE THEIR CABINS WITH US. Our stay in Twaine Harte was very enjoyable, there was plenty of room in the house, and it was very comfortable. Our dog especially liked the back yard, plenty of room to run and play. Rick W from Woodbridge, CA does not recommend this vacation rental. we have requested this cabin for a second time because it is at a great location within walking distance to town if you want to eat out. We walked in the snow when roads were closed and enjoyed dinner. The cabin is very nice and it has everything you need from firewood to dvd's to watch. It is close to one of the main roads in Twain Harte but you don't really notice it. The only thing I didn't like was that you really needed to go to the next road to turn around and park in front. That wasn't much of a problem since it still was our favorite place out of 3 that we have rented in the area.